Airbnb’s rise appears to be unstoppable. And in Greece’s crisis-scarred capital, the San Francisco-based company has found a (temporary) home. Greece’s severe economic crisis, which saw unemployment soar to 28 per cent in 2014, combined with its dependence on tourism, has created circumstances ideal for a company that relies on low prices and quick guest turnover. This summer saw record levels of tourism for Greece. At 32 million arrivals over the summer’s course, there were three tourists for every local. Whilst many vacationers headed for the islands, the impact of overtourism on the capital was noticeable. 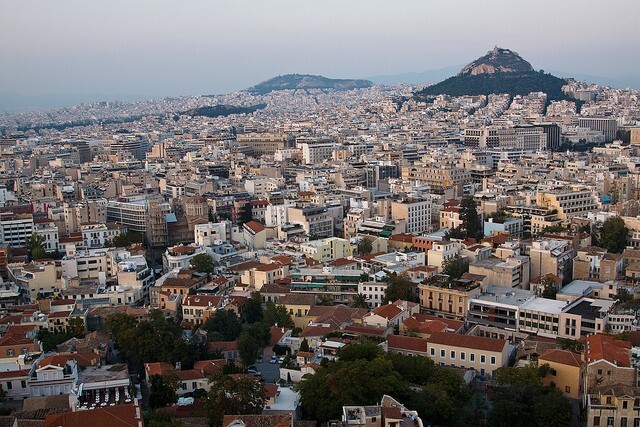 Since 2013, Athens city break visitors have increased by 600 per cent. Airbnb’s offer of affordability and flexibility has, without a doubt, played a role in the city’s tourism boom. However, the relationship between Airbnb and Greece’s capital is more complex than mere symbiosis. Whilst Athens’ city break boom is desirable from an economic standpoint, it has come with overtourism’s side effects of environmental and cultural erosion. Combined with the economic crisis that Greece continues to face — youth unemployment remains at a staggering 42.8 per cent — despite the crisis being declared ‘over’, Athens remains a vulnerable space ripe for exploitation. Some of the city’s hosts have been pushed by the crisis to put their homes on the online marketplace in order to make ends meet. But there are also a substantial number of properties that have been bought by investors for this purpose, at crisis-level prices, and are being rented out on the digital marketplace. Airbnb’s explosion has been divisive to say the least. Hoteliers complain that Airbnb’s low rates and ability to avoid tax is ruining their business. There has been considerable backlash from both local residents and housing advocates. Similar patterns are emerging across neighbourhoods in many major cities; Barcelona’s Gothic Quarter is a notable example, where there has been real backlash against overtourism. Tax legislation concerning Airbnb went into effect in January 2018, despite Airbnb refusing to provide the government with a list of registered properties, citing ‘privacy concerns’. Without a complete state registry of Airbnb properties, the company will provide another channel for investors to reap the financial rewards of untaxed income whilst most ordinary residents will see little benefit to their neighbourhoods — which are fastly turning into permanent open-air holiday resorts. That is, if they’re not priced out of their neighbourhoods. Airbnb’s tempting potential for turning a quick profit — especially if taxation is underenforced — is undoubtedly having a transformative effect on several central areas. Neighbourhoods like Koukaki and Exarcheia have become trendy hotspots for tourists to stay within walking distance of the Parthenon whilst also getting a taste of Athens’ ‘real’ side. A city-centre housing crisis is already emerging as a direct consequence. Landlords are unwilling to let their properties out as traditional long-term tenancies when they stand to make far more money by renting them out on Airbnb during the peak months. Alongside the changing character of many suddenly fashionable neighbourhoods, which has also raised rent prices, this means there is a serious problem around affordable city-centre housing for Athens residents. These are difficult problems to solve in any city. There are similar patterns emerging around Airbnb and gentrification across many major cities. But the issues take on a whole new dimension in Greece, a country that has become a byword for economic turmoil in recent years. The consequences of decades of corruption and the last ten years of externally-levied austerity have created circumstances that make the country ripe for privatisation, with foreign companies buying up huge swathes of the country’s assets, including the Chinese company’s COSCO Shipping buying of the port of Piraeus in 2016. In times of desperation and too many false starts at recovery, it seems like a luxury to bite the hand that feeds you. But Airbnb will fail to provide the city with the regeneration it desperately needs in the form of job security and well-planned investment in public infrastructure and services. If taxation legislation is not properly enforced, a company’s dominance is another opportunity for widespread tax evasion, a housing crisis in the making, and it risks gentrifying and homogenising large parts of the city — at the expense of poorer locals. Airbnb presents an image of community; occasionally renting out a spare room to visitors, a way to make a bit of extra money, perhaps enabling you too to have a weekend away. But this is a far cry from the statistical reality in Athens. As Sotiris Sideris has painstakingly detailed in his data analysis of Athens’ Airbnb market, the vast majority — 91.6 per cent of Athens listings — are high availability listings, meaning the property is available for over 60 days a year. Additionally, Sideris identifies another trend that punctures Airbnb’s rustic ideal of home-sharing and suggests a far more commercial dominance: 43.8 per cent of hosts have multiple listings. This is probably an underestimate, as it doesn’t account for hosts who may have listings across multiple accounts. In place of the communitarian ethos it presents, the reality is that a relatively small number of investors are transforming neighbourhoods and compounding urban inequality. Airbnb’s dominance risks turning entire neighbourhoods into ‘ghost hotels’ for tourists, making areas unliveable for residents, including the many students who move to the city each year, due to the lack of long-term lets and the raised rents the fewer available flats come with. Perhaps Airbnb will self-immolate; a key part of what attracts tourists is the enticing promise of a more authentic view of a city, which will inevitably cease to be genuine when certain neighbourhoods will only be home to a handful of long-term residents. But as long as Airbnb is able to undercut hotels so extremely, the price incentive will continue to bring in both tourists and investors — and push out ordinary residents. After a decade in crisis, many argue that beggars can’t be choosers, and at least the company is boosting Greece’s main export. Yet it begs the question: will overtourism and gentrification really be the country’s saviour, or just another head in the Lernaean Hydra of ‘recovery’? Originally published in Shout Out UK.